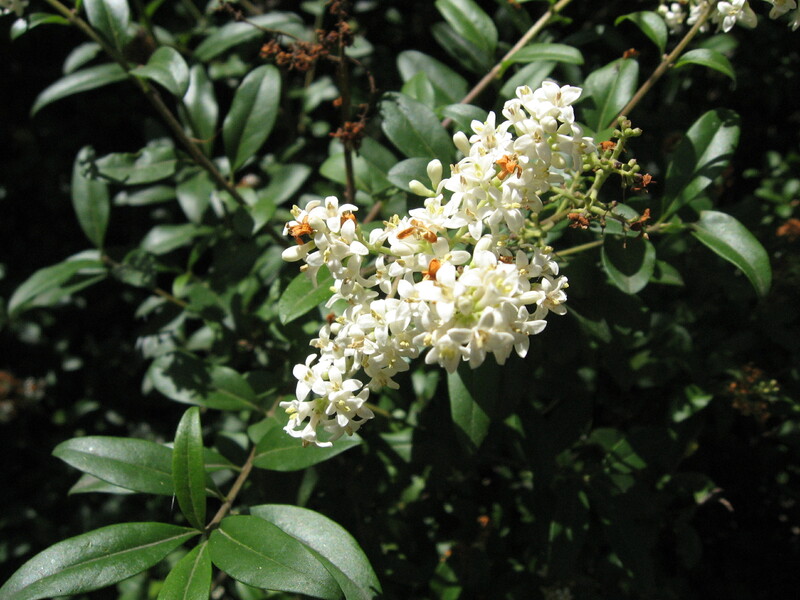 Ligustrum vulgare is a shrub, to 5 m, much branched, branches opposite, bark gray, young stems minutely gray-hairy. Leaves opposite, stalk 0.3-1 cm long, blade narrowly egg- to lance-shaped, 3-6 cm long, smooth, secondary veins obscure, stiff, semi-evergreen tip blunt to pointed. Flowers white, tubular, 4-parted, small, fragrant; inflorescence of small clusters at tips of stems, June. 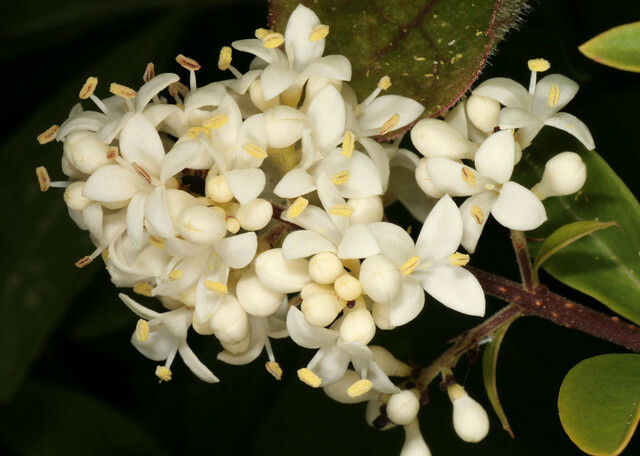 Ligustrum vulgare.flowers.© Copyright Malcolm Storey 2011-2115 · 3.discoverlife.org (Accessed 1/2017). Fruit fleshy, dark blue-black, 1 cm long, pulp lipid <10% (White and Stiles 1992) ripens Sept. (Dirr 1990), persistent through winter, dispersed by winter resident birds and probably early spring migrants. Habitat: Moist forest understories, successional woodland and scrub or near old house sites. Shade tolerant. Ligustrum vulgare.fruit. Photo Jean Baxter. Copyright © 2017 New England Wild Flower Society. gobotany.newenglandwild.org (Accessed 1/2017). Notes: Infected by Anthracnose blight (Glomerella cingulata, Ascomycotina) and Botryosphaeria dothidea, Ascomycotina, that causes death of leaves and twigs; and by Agrobacterium tumefaciens, a soil bacteria in the family Rhizobiaceae that causes crown galls of the root collar. Dirr 1990; Sinclair et al. 1987; Agrios, 1988). * L. amurense is listed in Stalter and Munir (2002), but only L. vulgare and L. obtusifolium are listed in Clemants (1999). Leaves and berries are toxic. Both contain syringin (ligustrin), a glycoside and shikimic acid, among others. (NC University Cooperative Extension; plants.ces.ncsu.edu accessed 5/2015). 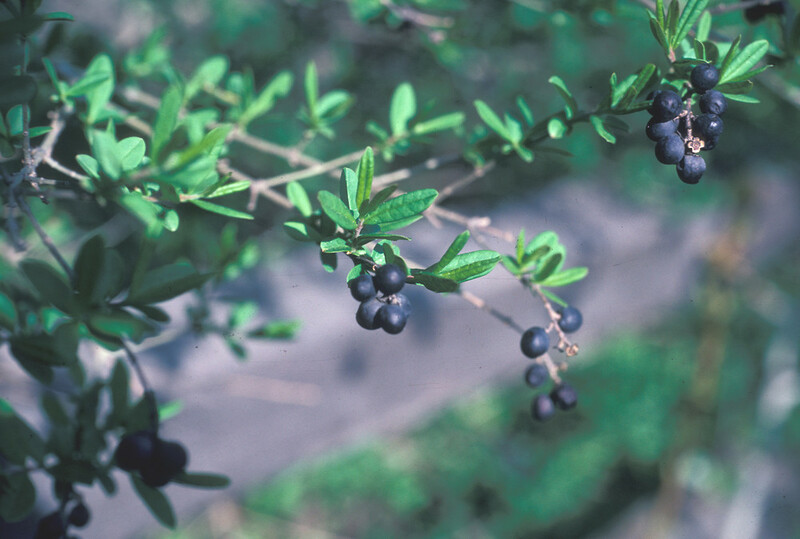 https://plants.ces.ncsu.edu/plants/all/ligustrum-japonicum-l-sinense-l-lucidum-l-v/).